We recently announced the release of Azure Stack Technical Preview 3 refresh with Azure PaaS Services. Coming as a part of this release is the Get Started tile that you have grown to love in public Azure. As of this release the tile will only contain content related to Azure Stack administration. We are currently working on bringing you separate experiences for the tenant and admin portals. You will be able to see those changes in future releases. 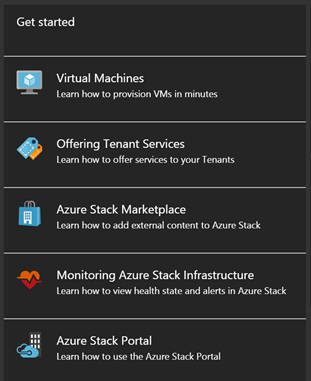 On the admin portal, the Get Started tile will give you an insight into experiences that are "Azure Stack" specific and do not necessarily apply to public Azure. These tutorial videos, created by Program Managers working hard on delivering these experiences to you, will introduce you to new concepts and ideas in Azure Stack and will quickly bring you up to speed on various components of Azure Stack administration. 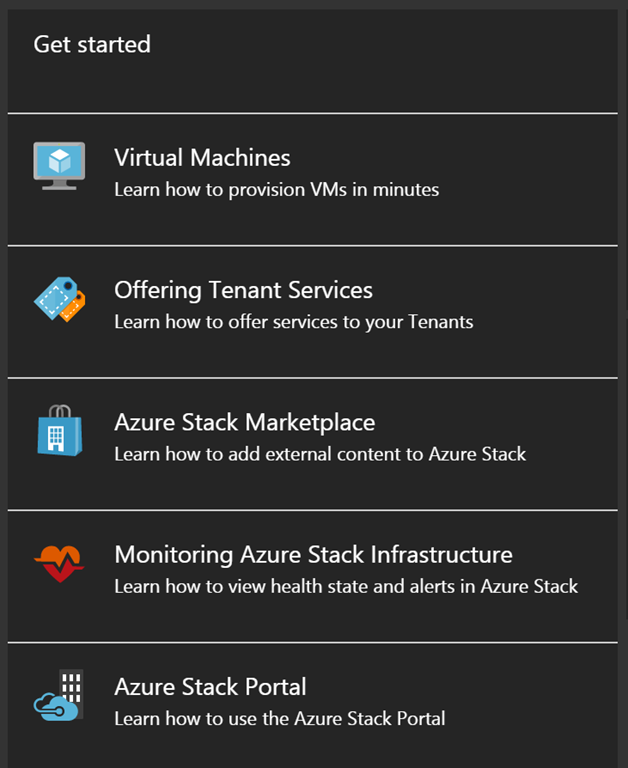 In these tutorials, you will learn how to make VM images available to your tenants, offer tenant services, add content to your Marketplace, monitor your infrastructure, and how to work with the Azure Stack portal. The content is hosted online with the videos being hosted on Channel 9, hence you will require an active internet connection to access it. We are really excited to bring these experiences to you and are looking forward to getting your feedback. Please let us know if you have suggestions on improving the content or if you'd like to see tutorials on new topics!